Beverage centers are the most popular type of undercounter refrigerator because they can hold everything from food platters to beer and wine bottles. You have more flexibility to hold wine bottles, unlike just refrigerators. Wine coolers and storage are great, but they also carry only wine. Which Beverage Center Should You Buy? There are tons of brands to consider. Many are decent like Perlick, U-Line, Marvel, Jenn-Air, GE Monogram, and Electrolux to name a few. In this post, you will learn the best beverage centers from True, Sub-Zero, KitchenAid, and our own Yale brand. Then we will look at reliability and find out which might be best for you. There are vast differences between the models, so it depends on the features and price. True is a commercial refrigeration company based out of St Louis. They started manufacturing residential products in the last five years. This beverage center is an impressive, well-built unit. It’s all stainless on the inside with a convection fan on the back for a consistent temperature. It's so well-built, it’s rated to be used outside kitchens and bars. The shelves glide out as well. You can even accent the inside lighting with your choice of 14 different colors. True is the most expensive at $3,999, but it’s the only refrigerator built to this standard. Sub-Zero is based out of Madison, Wisconson and pioneered built-in refrigeration for the home since 1945. This may be the only time Sub-Zero is less expensive than any other brand in any category. It is significantly less than True at $2500 but lacks the stainless steel interior and better shelving. Sub-Zero does, however, have a better seal to keep food fresher for a more extended period. They are also the only brand with a crisper bin for fruit and veggies. You can now buy a Sub-Zero beverage center for an outdoor kitchen with a $500 upcharge. Our brand is not stainless steel on the inside, and you only have three interior colors unlike True. It lacks the dual zone or crisper bin like the others. However, it is the least expensive at $1,649 with a 5-year warranty included, and it's reliable at under 6% repaired within the first year. Now, let’s look at reliability based on 34,687 service calls completed by us last year. I wasn't expecting to rate a KitchenAid beverage center so highly, but it’s the only dual zone unit, meaning you can store different beverages at different temperatures. Soda and beer can be kept colder on the top and separated from red wine on the racks below. Only wine bottles can be placed below where that second zone may be. The reliability and repair rate of beverage centers is excellent at 7.9% compared to the overall appliance reliability of 13.4% being repaired within the first year. You would expect that because beverage centers don’t have temperamental features like ice makers, dispensers and French doors. KitchenAid, Sub-Zero, and the Yale brand are less than 6%. True, on the other hand, is 43%. The good news is, they tend to be minor repairs, as opposed to compressor malfunctions. The bad news is it’s still 43%. This is a company supplying major commercial installations like supermarkets and delis. Given their sophisticated refrigeration experience, we all expect this number to drop. You have four very different products. Each has its specific advantages. True is the best built, but it is the most expensive. Sub-Zero has an excellent overall product especially if you may be storing fresh veggies. With dual zones, KitchenAid can keep lower temperatures for white wine or higher temperatures for red wine. This gives you the best temperature flexibility. Yale is a good beverage center with a great warranty at the best price. It depends heavily on your budget, where you’re installing it, and what you’re storing. Why are beverage enters so expensive? I wish I knew. However, they have similar compressors as larger units and have better controls and electronics in most cases. They also are made to fit in between cabinets. Can I buy just a cheap freestanding refrigerator? You can, but the freestanding units breathe from the back. The compressor will seize when you place it between cabinets due to overheating and lack of air flow. 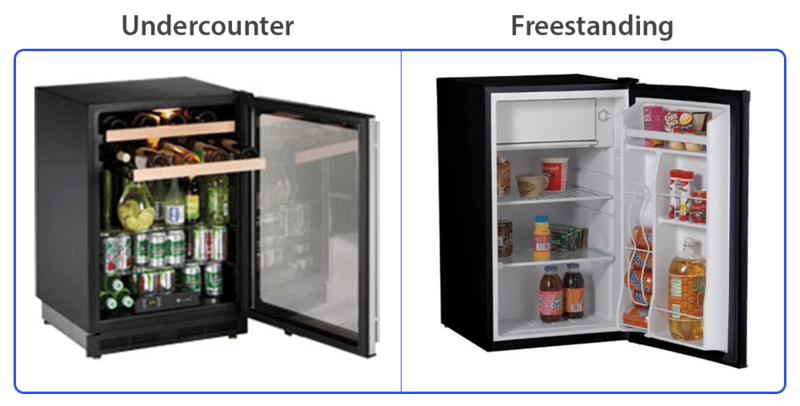 What's the difference between an undercounter and freestanding refrigerator? The main difference is the compressor location. Undercounter refrigerators breathe from the front and will not overheat between cabinets. Freestanding units breathe from the back and will overheat between cabinets. Undercounter refrigerators are also made of steel versus plastic with better controls and racks. The freestanding units are much cheaper. 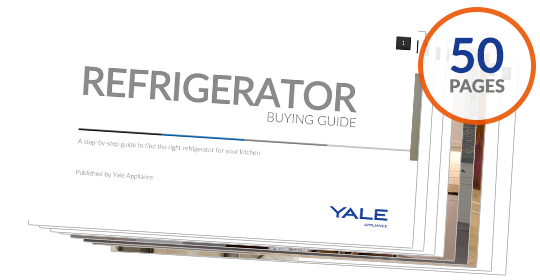 Get the Yale Undercounter Refrigerator Guide with features, specs and inside tips to all the beverage centers, refrigerators, freezers and ice makers. Over 410,000 people have read a Yale Guide.